A morphed image of a cruising boat from the of lines from two different vessels. Nice looking boat! 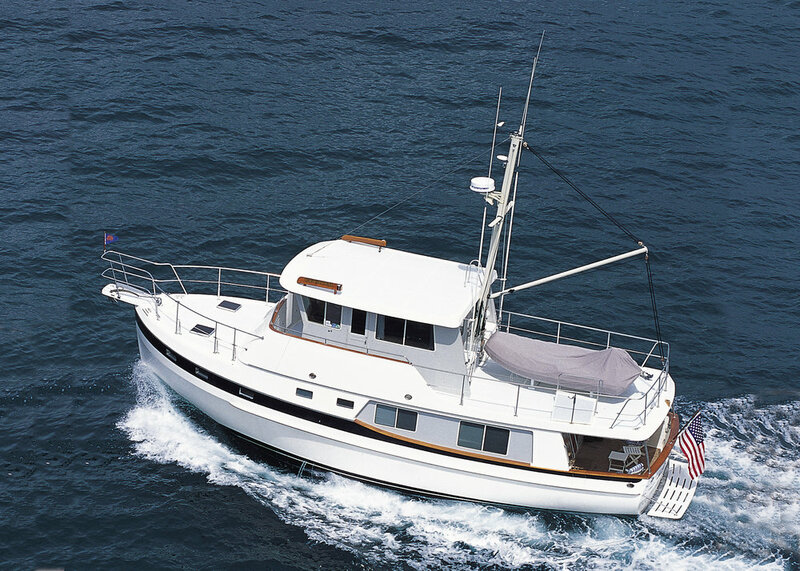 In the first post of this discussion about identifying and selecting a good cruising powerboat, http://bit.ly/whats_a_trawler, I hoped to convey that a trawler in the traditional sense has morphed or evolved into many different kinds of engine-driven cruising boats that don't rely on sails for propulsion. While some guys have some weird need to keep going round and round about what constitutes a real trawler, in my mind it has become a pointless discussion. Some general comments on hull shapes, from naval architects I've met over the years, starting with my first visit to B.C. Research in Vancouver, British Columbia. These folks test boat hulls with all sorts of runs in a long, 220-foot tank, and instruments measure and record trim angle, heave of the boat, resistance through the water (indicating horsepower requirements), amplitude (height of pitch), acceleration, and angle of pitch. After decades of experience performing tank testing, these technicians and naval architects have a pretty good idea of what happens with boats in the water. Generally, a longer, slender boat is better off for pitch and motion in the open ocean. While that seems somewhat obvious, I've also been told that larger boats are often at a disadvantage at sea compared to smaller boats that fit between waves. The least favorable situation with regard to motion is when a boat's LOA matches the wave period of sea conditions, the distance between the crests of successive waves. I spend time with Ed Monk, Jr years back and we got talking about boat size at sea. He mentioned that he and his father, noted designer Ed Monk Sr, had a fascination with rogue waves, and what minimum size boat was best for surviving them. His father spent a lot of time calculating as many variables as they could get find, develop, or validate. Their conclusion was that an 83-foot hull was the minimum size for running in oceans that might experience rogue waves. While I'm don't recall the reasons for this specific size, it was their preferred LOA to go to sea with confidence. I find this kind of odd, as Steve and Linda Dashew's previous Wind Horse is 83 feet LOA, and my most recent passage to Bermuda was on an 83-foot Camper Nicholson sailboat. Maybe this magic number is already out there and I just never heard it before. In any case, given that scientists now understand such monster waves are way more frequent than previously thought, I am reminded of that line in the movie, Jaws. "We're going to need a bigger boat!" It also turns out that coastal waters typically have shorter wave periods, so longer boats are better in those conditions, as smaller boats (that are better offshore) get into the range of coastal wave periods, and lose their advantage. As should be obvious, the ideal LOA of a boat varies with the areas it operates in. Steve Dashew is a big proponent of long, skinny boats. He said that one has to balance what's happening in the bow with what's happening in the stern. "You want the bow to slice into the waves a certain distance before it starts to lift, but still have enough buoyancy to lift the bow in a really big wave." At the same time, he went on, if the stern is too wide and too buoyant, the passing wave will lift the stern, which pushes the bow down. "So keep the ends fine." Planing hulls have come into our cruising fleet, because they offer benefits that make them ideal choices for some people. These hulls ride on top of the water beyond hull speed, using hydrodynamic lift for stability, and offer high speed and performance that is relatively efficient. The planing hull is a great choice for those with limited time for cruising. In fact, I know many boaters who are able to still make extended cruises in short order, getting to the cruising grounds quickly, and then slowing down to smell the roses. These people would otherwise not have the time to cruise at all, so this makes lots of sense. The Ray Hunt designed hull of the Grand Banks Eastbay line is seaworthy, efficient, and fast. Perfect for cruising on a tight schedule. You arrive sooner and with all the comfort and luxury of a traditional trawler. The downside of this hull shape is that fuel consumption can be considerable, especially in larger boats with more accommodations and storage, so generally have limited range and can't be as self sufficient for long periods as other trawler-style boats. The planing hull also is not very comfortable or easily handled in rough weather, where the boat must be slowed down and loses it stability. Some of these boats can be downright squirrelly at low speed with their smaller rudders. And the limited storage and tank capacities tend to keep things simple. The next hull shape to consider is the semi-displacement hull form. The semi-displacement hull shape has flat sections aft and a bow that lifts for higher speed, and allows operation over a wide range of performance. This hull is efficient at displacement speeds, yet offers a higher speed potential if desired. The semi-displacement hull is a good compromise of hull features, offering good storage and sufficient tankage for extended cruising and a proven record as a liveaboard cruiser. The capable Nordic Tug 40 shows how far the Washington builder has come since the first Nordic Tug 26 that everyone thought was so cute. The disadvantages of the semi-displacement hull are that it is not as stable in rough seas as a true displacement boat, and handling can also be difficult in following seas (where the generally flat stern is a big target for waves coming from astern.) Semi-displacement boats are not very fuel efficient when run beyond displacement speeds. When Grand Banks decided to make all of its boats capable of hitting 20+ knots with two huge engines, the fuel consumption of these boats was horrific. It was a poor decision. 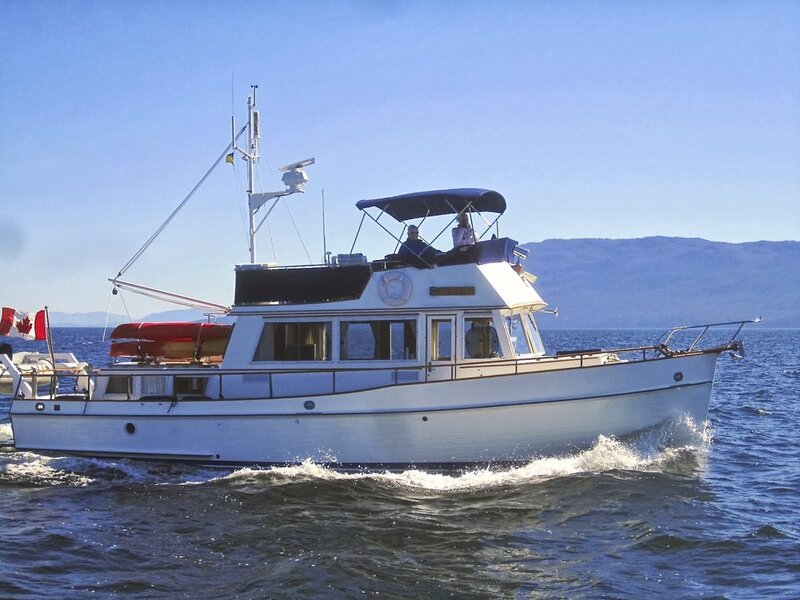 The hull of a GB 42 with either two smaller diesels or a single John Deere is a perfect match for extended cruising, such as all summer in Alaska. The GB 42 Classic is still a thing of stately beauty and gets approving nods wherever it goes. With two Lehman diesels it is a cruising dream. The vast majority of trawlers and cruising motorboats over the years have been semi-displacement boats for good reason, and their popularity is well justified. They are the best choice for most people not intending long ocean passages. The full displacement hull shape travels through the water, and is by far the most seaworthy shape for a cruising powerboat. It is comfortable at sea and at anchor, has good fuel economy, and goes the distance with long range. Its superior storage and fuel and water tankage allows for great living aboard and extended cruising, especially when there is no schedule to follow. Put all your belongings aboard and travel in the slow lane. Like the MTOA turtle logo and motto of years ago, wherever you stop, you are home. The Nordhavn line is all about long distance and self sufficiency. It can take you whenever you want to go. The Kadey-Krogen 48 Whaleback has ample livable space for truly living aboard in absolute comfort. No wonder it is a popular choice. Many people wrongly assume that their vintage Taiwan trawler is a full displacement boat, because it goes slow. Most of these boats are really semi-displacement hulls with lower horsepower engines for power. This was done strictly for fuel efficiency and economy. That was the point of the rise of trawlers in the first place...cruising with fuel economy. I remember when the Nova Scotia builder of the Monk 36 finally put a good-size Cummins diesel in its trawler, and suddenly the boat was capable of 18 knots! Put a big diesel in a Krogen, Nordhavn, or any full displacement boat and it won't go much faster. The disadvantage of a full displacement boat is that it is the slowest hull shape, typically along the order of 7–8 knots. The seaworthy shape is prone to rolling in a seaway, so some form of stabilization is usually fitted for crew comfort. The full displacement hull also typically has the deepest draft of any cruising motorboat, although many builders try to limit draft from being too excessive to allow cruising in places like the Bahamas and other cruising grounds lacking deep water. But a real full displacement trawler is decidedly seaworthy. Not conditions for pleasure boating but it is nice to know one's vessel can handle heavy weather. One of the early people who wanted to advertise in PMM was attempting to get a yard to adapt the local fishing boats into fully capable cruising boats. He lived in the Shetland Islands, and these boats fish in the North Sea. When Laurene was on the phone with him one winter day, he described looking out the window as the fleet headed back out to sea, during a blizzard. It was blowing a fresh gale, an 8 on the Beaufort Scale. I remember thinking that the boats' 10-foot draft had a lot to do with such seaworthiness. The power catamaran is the newest hull form to come into our market, and it warrants its own category. Displacement cats have a wide performance envelope, often using a small diesel engine in each hull to reach respectable cruising speed with good fuel economy. Power cats have generally shallow draft, and offer form stability due to the wide footprint of widely spaced hulls. However, unlike their sailing counterparts, they are not as beamy as they do not have a sail rig to contend with, and dockage is therefore not the issue it poses for a sailing cat. I never once had an issue finding a slip on Spitfire, our PDQ 41 power cat. I think our beam was less than a Fleming 55. The DuFours built this Tennant design for long distance cruising. They have put thousands of sea miles on Domino, and are in the Pacific at the moment. I shot this image when they came by our Annapolis office and took me for a boat ride to show off their boat. A serious passagemaker. The downside of some smaller catamarans is their ability to carry weight, but that is not necessarily a bad thing. I once owned a displacement power cat to experience the hull shape, and found it to be a very competent cruising boat and I would not hesitate to make a passage in a large power cat. JP and Marie Dufour are exploring the South Pacific on their 20-meter Domino, a Malcolm Tennant design. The power cat has much to recommend it. One of Bob Vincent's Endeavour Cats, which are popular for the Great Loop. He designed a lot of living space on these boats, and now offers outboard power to his new boats. They are so much simpler, and at day's end, you raise the outboards out of the water to keep them clean. Which brings up another example of why a trawler is a mindset, not a specific design. I met several couples recently at the shows who happily cruise on their sailing cats. The slippery shape and efficiency is noteworthy, and unless they are sailing downwind, they alternate running the two small diesel engines to get a typical trawler speed of 7 knots on one engine. These people cruise pretty much the same as anyone else on an Albin or Marine Trader. To help with the process of deciding where to focus on in the above field of choices, there are some basic questions that must be answered honestly if one is to make a good choice. And that is our next post in this discussion.